Are you ready for an expert and friendly IT company? Over 800 satisfied home users since 2005. East Montgomery County / Bucks County area. Providing technology related support for businesses and home users. Cut expenses by introducing efficient technology. We will help you implement internet redundancy, company wide antivirus solutions and immediate server backup restoration. We provide our own comprehensive offsite backup solutions with immediate support and restore. We can also help you implement an efficient local backup. We will troubleshoot and diagnose network latency, internet speed and wireless coverage issues. We can deploy a variety of network services so you can run your business more efficiently. We will help you choose and use the best smartphones and tablets for your company. Apps since 2007 and it allows users to work from anywhere in the world and share and collaborate and edit live documents and spreadsheets. We will clean your office computers or home computers - and install the software you need to keep viruses and malware from infecting you again. We will help you upgrade and clean up your old system so they run like new again. We will help you update and upgrade your systems. Cut costs and free yourself from full time IT support. Get help when you need it. "Rock-It Cargo thinks you guys are great and provide excellent service! We have no complaints." "We have been very pleased with your prompt, friendly and thorough service. Most of all, it is important to us to have someone we can trust and rely on to be there when we need them...because having a down or infected or compromised computer is a threat as well as a nuisance. Thanks for all of your help and guidance over the years and you can count on us using your services for a long time! Sincerely,"
"We have been working with Nobre Computer Services for several years and plans to continue doing so. Nobre has helped us with a wide range of technological issues, including: new server/network integration, resolving various software and hardware conflicts, data recovery, storage/back-up solutions and more. Their service is both prompt and friendly, and they resolve most issues quickly and efficiently." presented with a friendly expert who is eager to help. 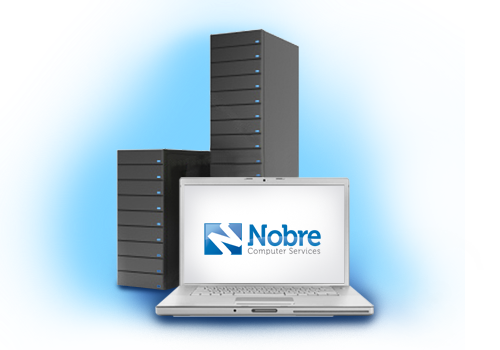 Nobre Computer Services provides expert service & friendly support for businesses & home users. Copyright © 2019 NobreBackup. All rights reserved.